All of Save a Turtle's permit holder's, our Technical Advisor, and President were able to attend the Florida Marine Turtle Permit Holders Meeting which was held in St. Augustine, FL. 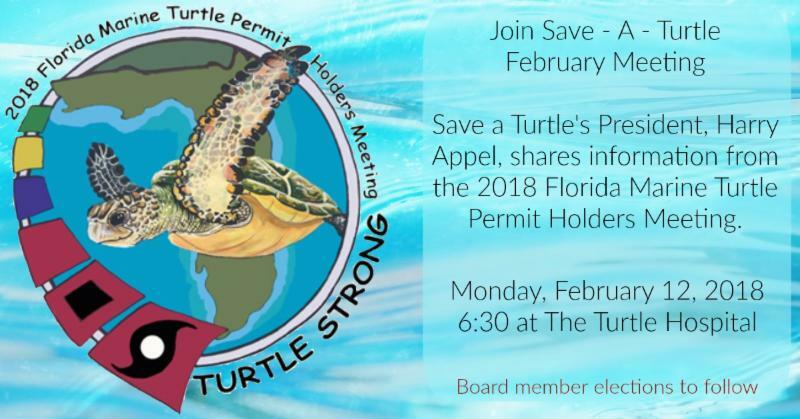 During the meeting tonight, Save a Turtle's President, Harry Appel, will provide updates from the State meeting, and the impacts of Irma on our nesting beaches. After the presentation the board will meet for the Monthly Board Meeting, all are welcome to stay for the board meeting as well. This month will also include board elections for the 2018 year. We look forward to seeing you there! Please be sure to visit us on social media, like our pages and share with your friends and family.